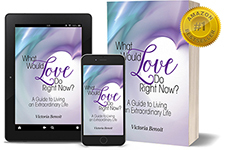 Sign up for our newsletter and download a FREE excerpt of my newly-released, Amazon #1 bestselling book, What Would Love Do Right Now? A Guide to Living an Extraordinary Life. By submitting this form, you are granting the Center for Extraordinary Outcomes, LLC permission to email you. You can opt out using the Unsubscribe link found at the bottom of every email. We take your privacy seriously, we never disclose, give, sell or transfer any personal information. Emails are serviced by MailChimp.